The new coin was put on a very tight production schedule. Baker asked for a few small design changes, which de Francisci made, and the obverse and reverse designs were presented to President Harding. Harding asked that a small dot be removed from Lady Liberty’s face because he thought it looked like an inappropriate dimple. De Francisci removed the dot, and the coin went into production. The Peace Dollar stimulated controversy immediately. The reverse side of the coin had been described in a Mint press release as “a large figure of an eagle perched on a broken sword,” and the New York Herald, which was a very influential newspaper at the time, began campaigning against that broken sword. According to the Herald, a sheathed or blunted sword would have been all right because they symbolize peace, but a broken sword was offensive because it implies defeat or surrender. When the Mint began to receive letters echoing the Herald’s point of view, they convinced de Francisci that the broken sword must be removed from the design. Unfortunately that was easier said than done because the hub for the coin had already been created and the Mint could not afford the delay of making a new one. This meant that the broken sword would have to be physically removed from the hub itself. As de Francisci looked on, the removal was done by George T. Morgan, the Chief Engraver, using extreme magnification and very fine engraving tools. The removal job was actually even more difficult than it sounds because Morgan had to create background detail in the design that would previously have been hidden by the sword. 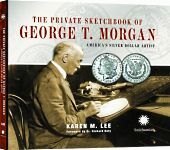 As usual, Morgan did a masterful job, and the general public never suspected that the coin’s design had been changed so late in the production process. The first Peace Dollars were minted on December 28, 1921, with the first coin presented to President Harding (although, strangely, that coin never seems to have been seen again). 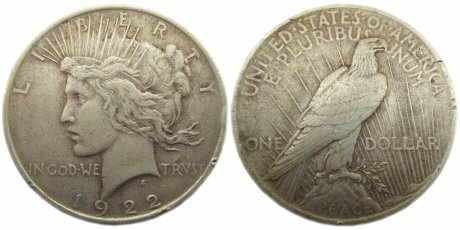 According to the Mint, over a million 1921 Peace Dollars were struck in 1921, which many people feel is a little ridiculous considering that there were only four days left in 1921 to strike those coins. The consensus among coin historians is that most of those 1921 coins were actually minted in early 1922. Just two weeks into the production run the production of the Peace Dollar was halted because the dies kept breaking. The Peace Dollar was a very high-relief coin (meaning it had a deep design that required great pressure during the minting process). De Francisci and Mint officials tried to solve the problem without modifying the design, but eventually de Francisci agreed to reduce the relief of his design in order to spare the dies. He prepared revised plaster models that were reduced to the size of the silver dollar using a complicated piece of machinery called a Janvier pantograph-lathe. Unfortunately, no one at the Mint was a particular expert in the use of a pantograph-lathe, and many experts think that the low-relief Peace Dollars did not turn out as well as they could have because of this technical inexperience. As with the Morgan Dollar, Peace Dollars were mostly popular in the Western United States, where people still tended to prefer coins instead of paper money. In the rest of the United States, Peace Dollars spent most of their time in bank vaults. The Peace Dollar was produced every year from 1921 until the silver obtained via the Pittman Act ran out in 1928. Production resumed in 1934 and 1935 due to another (short-term) congressional act requiring the government to buy silver, but after no Peace Dollars were produced in 1936, Mint officials decided there would be no further need to produce them and destroyed the master dies in 1937. In 1964 Congress passed legislation that would result in the production of 45 million new silver dollars, once again primarily for use in the West, but this time targeting the casinos of Las Vegas. Mint officials found a few Peace Dollar dies that had not been destroyed, but they were in sorry shape, so new dies needed to be produced in a hurry. Many in Congress were resentful of a plan to mint coins that would not benefit the entire country, but there was a public uproar when the new coins were announced in May 1965 and coin dealers immediately offered to buy them for $7.50 each for their silver content. Putting that high a price on newly minted coins meant that they would never circulate as currency — why use a silver dollar as a dollar when you can get over seven times that much for it from a coin dealer? To quiet the controversy, the Mint issued a press release insisting that the three hundred thousand coins they had already minted were merely “trial strikes,” never intended for circulation. The 1964 Peace Dollar “trial strikes” were melted down, and none are known to exist today. The new Congressional Coinage Act of 1965 put a stop to the production of new Peace Dollars and forbade the production of any new silver dollars for at least five years.